Let’s go back in time for a little bit, shall we? 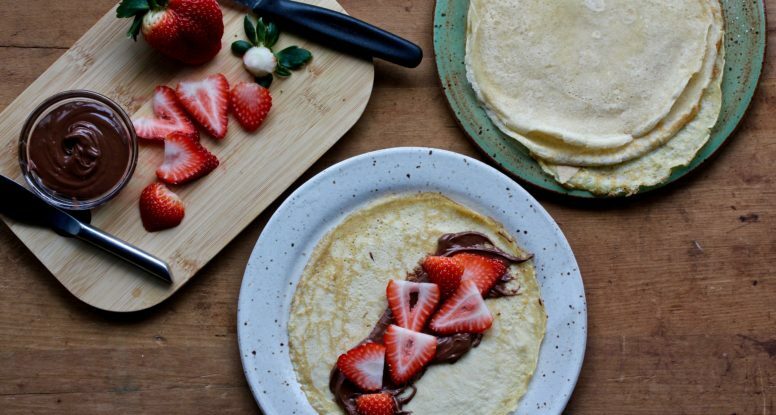 If you had told me that one day I’d be writing a blog post about crepes, I would’ve said, “what’s a crepe?” Seriously. Blame it on growing up and living in the Midwest, but I’d never heard of them until AFTER I went to college. Or perhaps, what might be more accurate is that I heard the word and thought, “nope, too fancy for me.” Now I know better. And so should you! Am I the only one who ends up with an exorbitant amount of eggnog leftover after Christmas? It always seems like there’s some extra kicking around in the bottom of the carton and I’m always left scratching my head, pondering what the heck should I do with it. Most normal people would probably drink it. But, I much prefer to turn it into something magical. 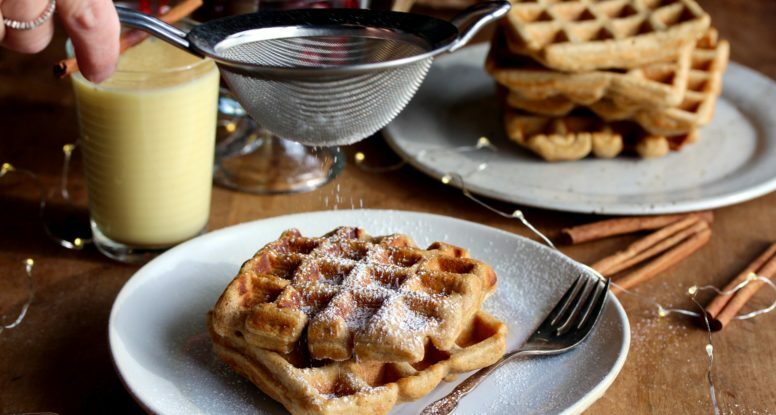 And for me, magical equals Whole Wheat Eggnog Waffles. For some reason, I really love breakfast food. Eggs, bacon, pancakes and all of it just makes me so happy. Perhaps that’s why you’ll find so many breakfast recipes on my site! Ha! 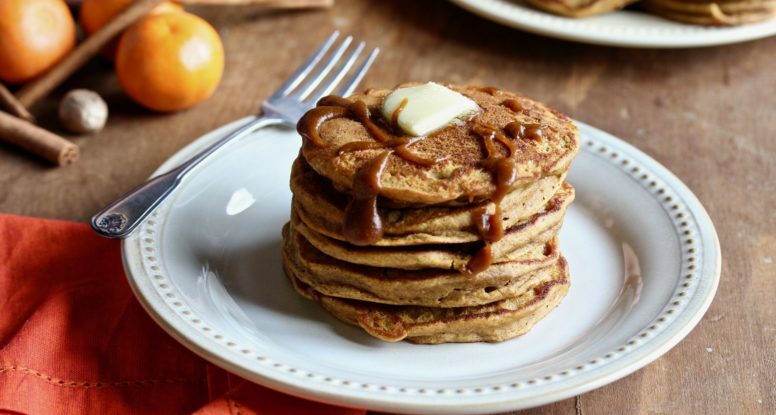 And now, since it’s officially (ok, unofficially) PUMPKIN season, I had to whip up some Buttermilk Pumpkin Pancakes. And of course, I had to share the recipe with you! So, I’m kind of up to something at the moment. Mums the word, but I’ll be sharing the deets soon, I promise. 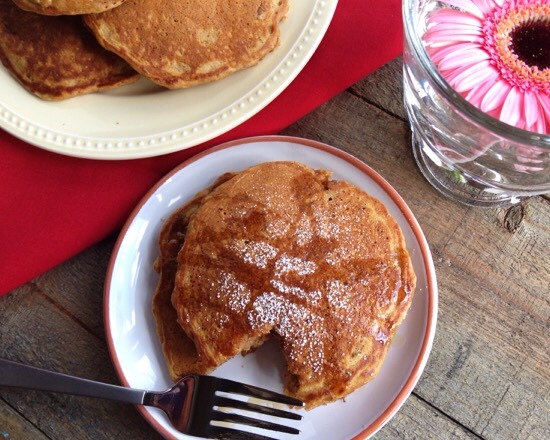 In the meantime, I’m treating you to these summer-inspired Graham Cracker Pancakes! Yes, they are my favorite breakfast food. I grew up eating a certain brand of frozen waffles and always felt like they were such a treat whenever they showed up on my plate in the morning. The theme of this month’s redux is “back to the dinner table” and I love this theme because I am a huge advocate of sitting down at the table and eating and enjoying meals as a family. When I grew up, this was something we did, maybe not for every meal, but as often as we could. Sure, it was a little crazy at times and there were definitely instances where foods was pushed around on plates or tossed across the table, but it was great and I have many fond memories of sitting and eating with my family. The tradition of sitting down and eating dinner as a family continues at my house. And to honor the family dinner, I thought pancakes were in order since they happen to be one of our favorite foods. And hey, breakfast for dinner is always fun, right? 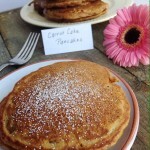 My husband happens to really like carrot cake, so he inspired these little Carrot Cake Pancakes. It’s totally like having your cake and eating it too. The great thing about them is that these little cakes are loaded with nutrition instead of fat and calories. To top off the theme of family, I have to include a special thanks to two very special people who helped me with this recipe and blog post, my mom and her husband Stan. Notice how awesome these pics look? Yup, that’s their handiwork! My mom created those amazing vignettes and Stan was an expert at holding the makeshift paper “screen” to help create/block light. They also happily obliged to taste-testing, and judging by the looks of the empty plate, I’m assuming they liked them. So, from my family to yours, we wish you many happy meals at the table! 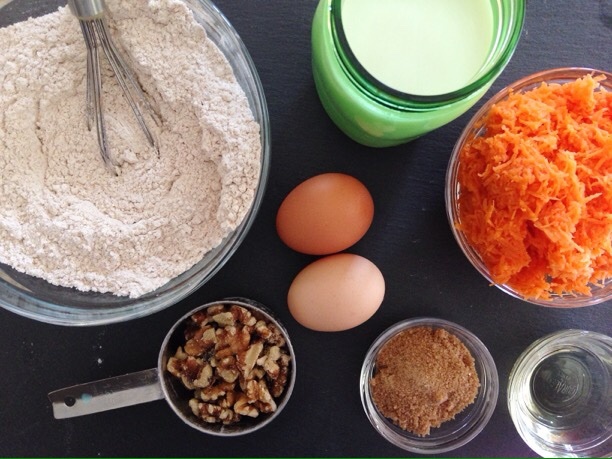 The tasty goodness of carrot cake without all of the fat and calories! 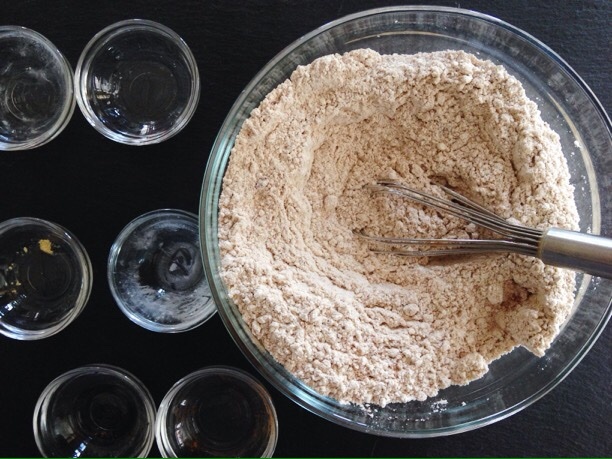 In a large mixing bowl, whisk together the flours, baking powder, baking soda, salt, cinnamon, nutmeg and ginger. In a separate mixing bowl, whisk together the eggs, milk, oil and brown sugar. Stir in the nuts and carrots. Add dry mixture to wet mixture and stir gently until combined. 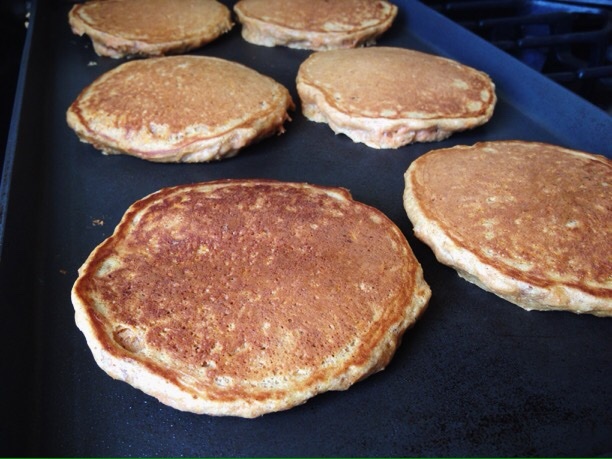 Heat non-stick pan or griddle over medium-high heat. 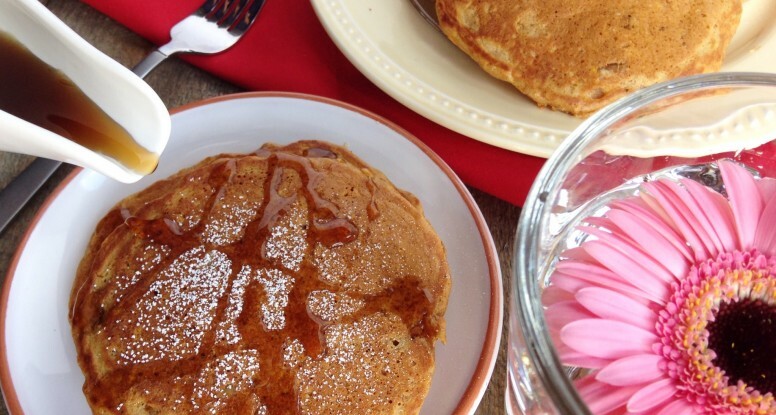 Once hot, spray with non-stick cooking spray and drop pancakes onto hot pan using a 1/4 cup measuring cup. Cook on the first side until batter begins to bubble, then flip and cook the other side an additional 2-3 minutes or until lightly browned. 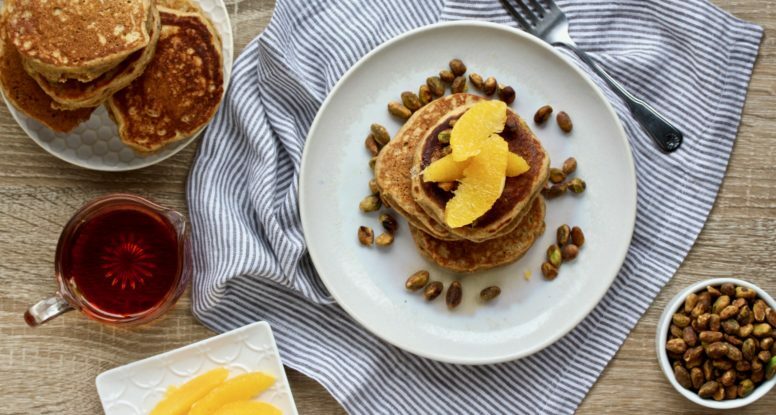 This recipe serves 8, which gives each person two delicious pancakes apiece. Transporting your waffles to a warm, happy place. I love when Recipe Redux time rolls around each month. It gives me inspiration for creative time in the kitchen, which I love. This month’s theme is “stop being wasteful and use the stuff that’s been sitting in your pantry!” Ok, that’s just my summation of the theme. It was put more eloquently of course, but that’s basically it. Pick something that’s been in the pantry for awhile and put it to good use. Great idea! So off I went to my pantry, on the hunt for something inspiring. I opened the door and immediately (and embarrassingly) noted its “fullness.” Ugh, there was plenty of food in there that was simply begging to be used. So I acknowledged my pantry with a quick “noted” comment and promised to cook and use that food before it went to waste. Then it was back to my original task…finding the one thing that’s been in there for far too long. After a quick inventory, it came down to three things: brown rice, canned diced chiles and light coconut milk. A glance at the packages revealed that the light coconut milk would be heading to the trash can soon if I didn’t use it, so the light coconut milk was the winner. Now, just what was I going to do with it? I immediately thought of Thai food. So many delicious dishes use coconut milk and I had a million (ok, maybe just two or three) ideas running through my head. But then something struck me. Maybe it was the delicious scent coming from the apartment next door, but I swear I smelled waffles. It smelled so amazing, that my thoughts of Thai food were immediately replaced with thoughts of waffles. 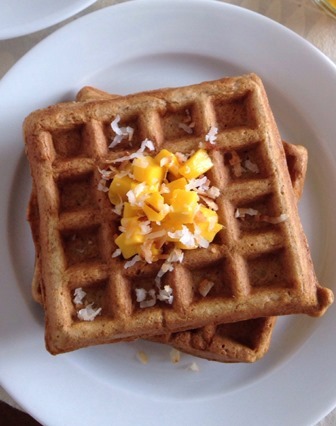 Then, the light bulb went off and my Vanilla Coconut Whole Wheat Waffles were born. 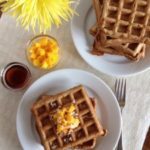 I adore waffles which made this recipe even more fun to create! 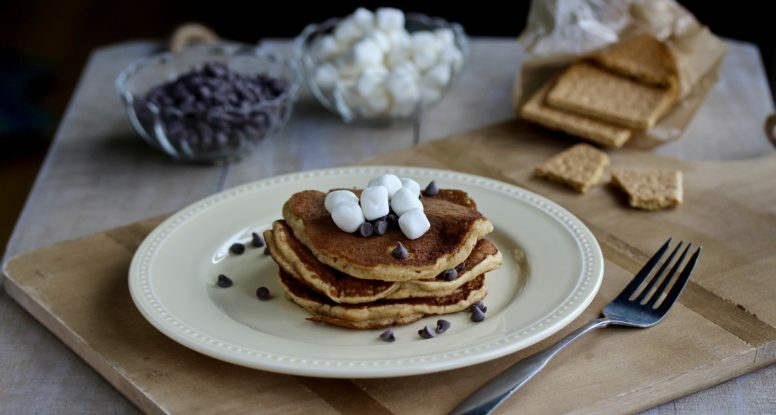 They are a great breakfast option, especially when all-purpose white flour gets replaced with whole wheat flour and when a simple topping of fresh fruit is the perfect finishing touch. Coconut milk and a little toasted coconut add a fun tropical twist and the vanilla bean paste add just the right of balance and “sweetness.” These are a perfect treat for breakfast or a handy snack. 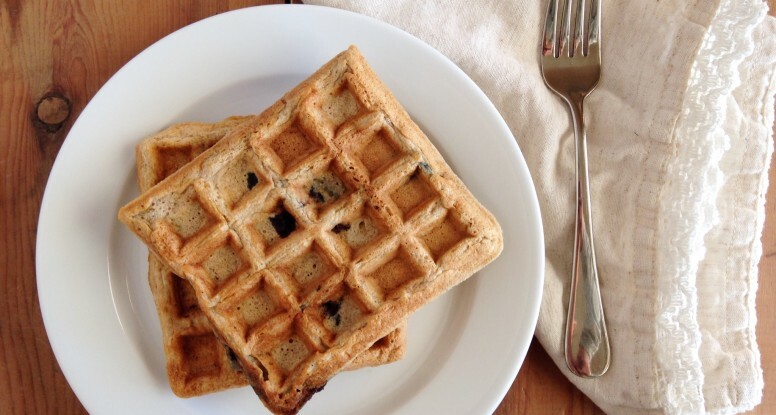 Try these waffles and I promise you’ll fall in love. 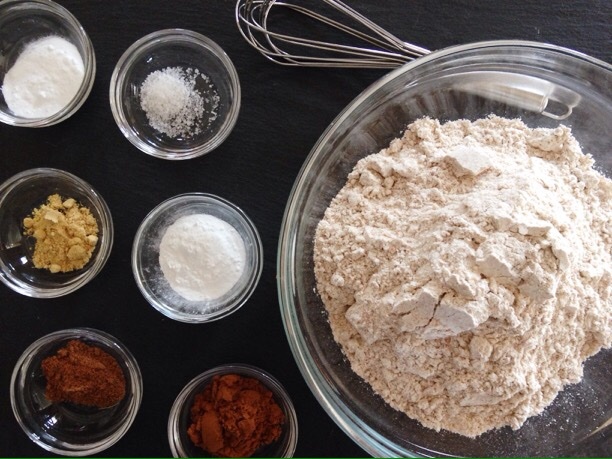 Ok, so my part is done…now it’s time to take a look at what’s in your pantry! 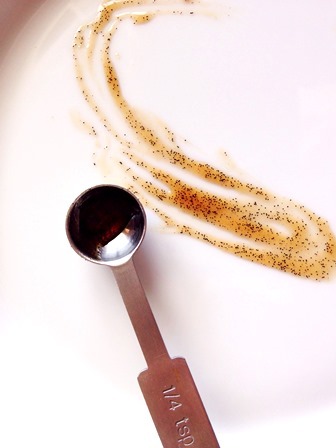 Delicious vanilla bean paste. A pantry must-have! 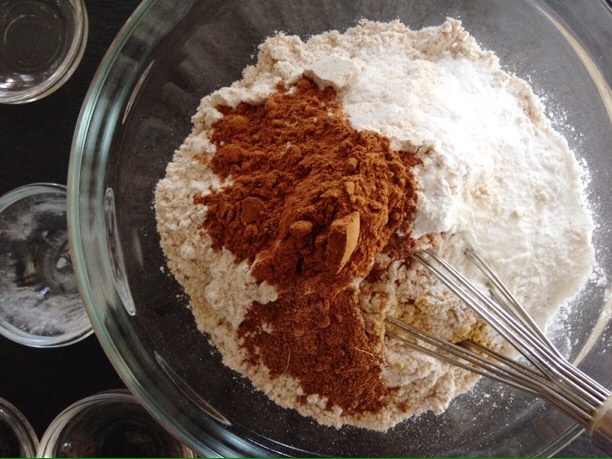 In a mixing bowl combine the flours, baking powder, baking soda, salt, ground cinnamon and flax seed. In a separate mixing bowl whisk together the eggs, milks, butter, vanilla and brown sugar. Pour the wet ingredients into the dry ingredients and stir until just combined. Note that the batter will be slightly lumpy. Gently stir in the coconut. Cook waffles following waffle iron manufacturer’s instructions. Serve garnished with freshly chopped mango and toasted coconut. These waffles freeze well. Place them in a freezer bag, separated by pieces of parchment and freeze until ready to eat!